Imagine a world where there are only two classes: people with power, and people without. Imagine a world where cities are ruled by families with magical powers, where their will determines their citizen's lives, and where the strongest thrives. For Elijah Hunt he doesn't have to imagine a world where bullies rule. He lives it everyday under the cruelty of his magical father: the Overseer of Chicago. Will Elijah choose to run from the father determined to mold him into a monster too, or will he stay and face his future? Will Eli even have magic of his own? The stakes are high as Eli and his sisters have to choose whether to stay or run for their lives. 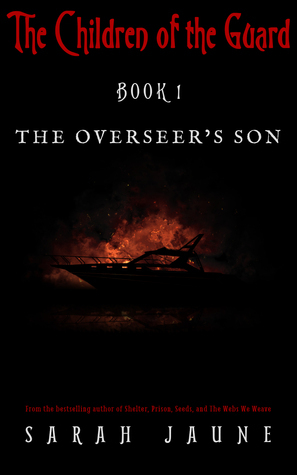 Although the introduction may come off as a bit of an info-dump, the majority of The Overseer's Son is a fun coming-of-age story propelled by big magic, engaging dialogue, and a clear moral foundation. As Elijah meets new friends who help him unlock his potential, he also witnesses the true state of the Chicago first-hand. Readers learn about an expansive world that blurs genre by combining technology and magic, and Elijah learns about problems too big for any one person to fix, but also too big to ignore. These discoveries drive him to moral crisis as he confronts the man his father wants him to be, the man others hope he can be, and the person he thinks he is. Elijah receives wonderful support from other characters but finds that he still must fight an internal battle – will he grow up to be a monster like his father? Can he truly escape his father's physical and emotional influence? Sarah Jaune addresses many of the issues that stem from childhood abuse, and does so in a way appropriate for upper middle-grade and YA audiences. The Overseer's Son hints at bigger mysteries to be explored in later books, adding depth to the world while promising an adventure-oriented plot. Dark undertones introduce the readers to deep issues such as poverty. Yet, Elijah's story is a positive narrative of overcoming obstacles with the wise and loving support of family and friends. I will be signing copies of my speculative fiction chapbook, Premeditations, on April 16th from 10:00 AM to 12:00 PM at the North Carolina Speculative Fiction Foundation's vendor table at Oak City Comicon. Oak City Comicon is a family-friendly, one-day convention that runs April 16th from 10:00 AM - 6:00 PM at the Raleigh Convention Center. Kids 8 and under are FREE. Their guest list includes Howard Chaykin who illustrated the first ten issues of the Marvel Star Wars comics series. Oak City Comicon was conceived and created by Alan Gill and Tommy Lee Edwards, the same gentlemen who bring you the fan-favorite NC Comicon each November. On top of hosting an abundance of comic book professionals and the best local comic book stores and vendors from across the state, Oak City Comicon will be a new destination for those individuals who love costume and cosplay. In fact, the show will facilitate a cosplay contest with a grand prize of two all-access, 3-day passes to the 2016 NC Comicon. So come say hello, get your signed copy, and browse the works of other NC writers! Sign up for my author mailing list to be the first to hear about my appearances and my publications.